Nast’s second cartoon in the August 10 issue emphasizes that Horace Greeley is under the control of Tammany Hall, the influential Democratic political machine in New York City. The cartoonist portrays the presidential candidate as a “Cat’s-Paw”—someone who does the dirty work of another, in this case, the corrupt ex-Tammany boss, William Tweed. The term originated in the fable of a monkey who uses a cat’s paw to retrieve roasted chestnuts from hot ashes. 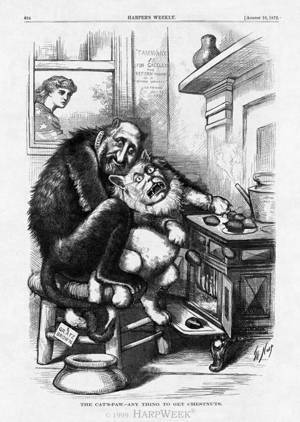 Here, Tweed-the-monkey looks on hungrily as he steers Greeley-the-cat’s-paw toward the desired “chestnuts” of federal patronage in cabinet departments, customhouses, and other agencies. On the back of the stove, the “Liberal War” teakettle lets off steam (a tempest in a teapot). In the background, a concerned Columbia peers inside through the window.